The Utah Department of Environmental Quality’s Waste Management and Radiation Control Board denied EnergySolutions‘ request for an exemption to state regulations requiring a performance assessment prior to the disposal of depleted uranium (DU). 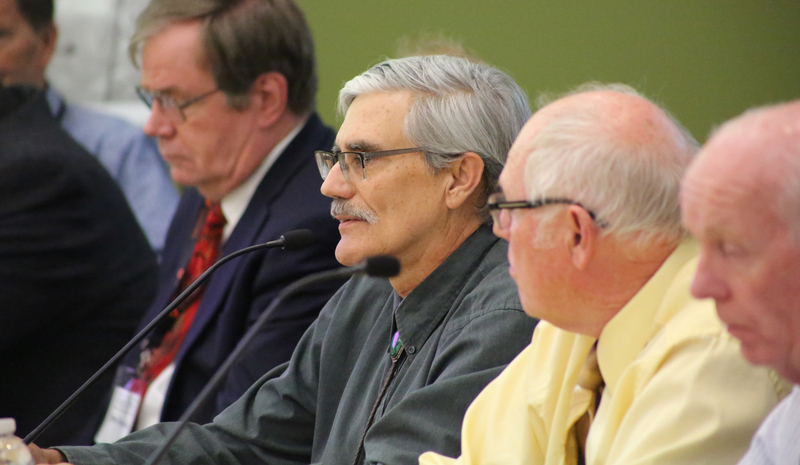 DEQ Low-Level Radioactive Waste Manager Don Verbica explains staff recommendations on EnergySolutions’ request for an exemption from performance assessment requirements for the disposal of depleted uranium munitions at its Clive facility. While the board expressed confidence in the company’s ability to safely store low-level radioactive waste, it rejected its request to do so without a performance assessment. The vote was unanimous, with one board member absent and board member Vern Rogers of EnergySolutions recusing himself during voting. DEQ scientists expressed concerns about the tendency for DU penetrators to break down in the environment. EnergySolutions, a radioactive waste management company with facilities in Tooele County, Utah, asked to dispose of approximately 10,000 metric tons of solid, depleted uranium metal from the disassembly of munitions (depleted uranium solid-metal penetrators, also known as DU Penetrators) from the Department of Defense. Under state rules, a performance assessment is required to demonstrate that performance standards will be met prior to disposal of more than one metric ton (total accumulation) of concentrated depleted uranium. If the exemption had been granted as requested, EnergySolutions would not have been required to complete the performance assessment. Staff from DEQ’s Division of Waste Management and Radiation Control made a lengthy presentation to the Board and answered questions. Concerns raised by staff included the geochemically unstable nature of DU metal, its reactivity in a moist, carbonate-rich environment such as at Clive, and its ability to react to form explosive substances. DEQ said it could not support the exemption without a specific DU metal performance assessment that demonstrated that there would be no undue hazards to public health and safety or the environment and that performance objectives would be met. SC&A environmental consultants stressed that Utah regulations require a performance assessment for the disposal of more than one metric ton of depleted uranium. Consultants from SC&A, an environmental and energy consulting firm, shared their analysis of data provided by EnergySolutions. SC&A stated that Utah’s regulation on the matter was clear: a performance assessment is required for disposal of more than one metric ton of depleted uranium. They also noted that the performance assessments cited by EnergySolutions were not site-specific for DU. Finally, they stated that EnergySolutions had not demonstrated that an exemption from this regulation would not result in undue hazards to public health. An EnergySolutions’ representative also addressed the board. He responded to DEQ’s presentation and countered estimates of the tonnage of DU munitions to be stored under the company’s request. 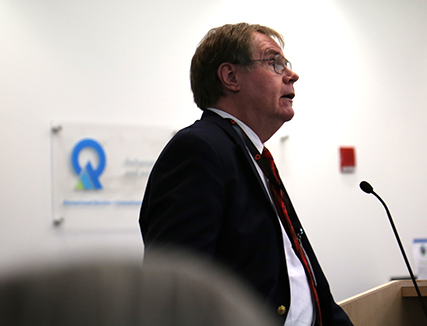 He also refuted claims about groundwater contamination and other human-health risks. The Division of Waste Management and Radiation Control received more than 200 comments on EnergySolutions’ request. The comments unanimously opposed the request to take depleted uranium. Comments ranged from emotional pleas to technical responses. Board members listen to the presentations before voting. Tooele County is assumed to have 40 percent of the DU that EnergySolutions wanted to accept. The DU stored at the Tooele Army Depot is managed by the Army, which has strict protocols for the storage of munitions. The DU at the Depot is not exposed to weather, is stored as inventory ready for use by the military, and is not considered waste. The full public notice, correspondence, and supporting documents regarding EnergySolutions‘ request for an exemption are available on the DEQ Public Notices page. Presentations made by DEQ staff and SC&A during the October 25, 2018, board meeting can be found in the Board Minutes on DEQ’s webpage on the DU exemption request.